Pereira: What can NFL officials do to deal with the snow? Well, the snow is falling ... seemingly everywhere. Wish you could hear me singing, but trust me, it’s very good. Actually feels kind of appropriate for a change here in the "ice cube" my crew and I call home at the FOX Network Center, since in many of the early NFL games here in Week 14 the snow is coming down. Remember in the "snow plow" game between New England-Miami back in 1982 when the tractor with brushes took a little veer off the 5-yard mark and cleaned the area where New England attempted a field goal? Not going to happen Sunday. — You can clear the sidelines, goal lines and end lines. — You can clear the 10-yard stripes behind the offense, not in front of the offense. — And during play, during a timeout, the only thing you can clear in front of the offense is the goal line if the referee deems that the goal line is not visible. If the offense is inside the 20, you can not clean the 5-yard stripe directly behind the offense because it might end up benefiting a field goal attempt in an area that’s clean, so therefore, that’s not allowable. 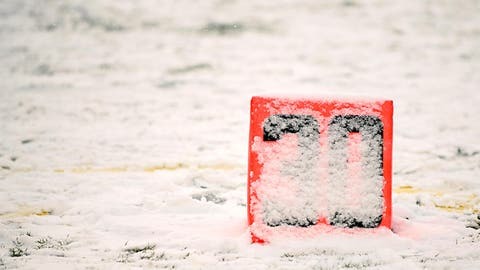 The kicker and holder can’t use anything like a brush to clear the spot of where they are going to attempt a field goal, but they can scrape off the snow with their hands or feet. Just no artificial tool. In the end, common sense plays a factor and there are specific guidelines in the NFL manual to make sure that what happened in New England in 1982 doesn’t happen again.